Debut author Francesca Armour-Chelu has created a desperate flooded dystopian world in this fast-paced story of one boy’s survival. 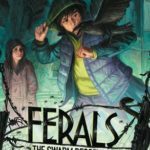 When Fenn’s parents are killed by the vicious Terra Ferma who are determined to wipe out all Seaborns, Fenn survives thanks to Halflin who does everything he can to keep Fenn safe. But Fenn is a child with a special destiny and Chilstone, the heartless leader of Terra Firma, is determined to get him. Can Fenn stay one step ahead of his pursuers?